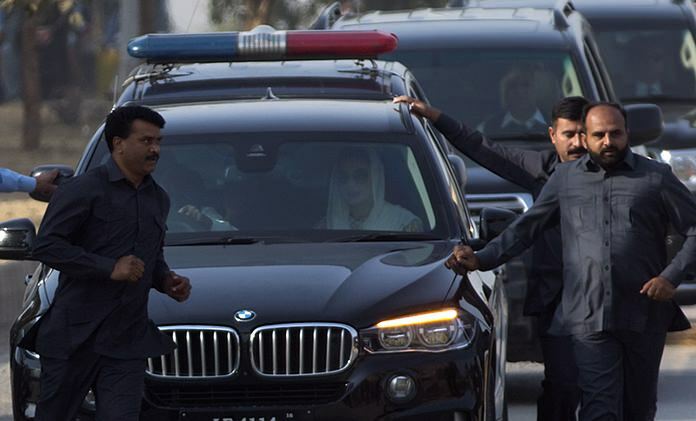 Islamabad (AP) — A Pakistani court on Thursday indicted former Prime Minister Nawaz Sharif as well as his daughter and son-in-law on corruption charges stemming from documents leaked from a Panama law firm. A lawyer for the 67-year-old Sharif, who is currently in London, where his wife is receiving medical treatment, entered a plea of not guilty. The former premier’s daughter, Maryam Sharif, and her husband, Mohammad Safdar, attended the hearing at the Accountability Court and also pleaded not guilty. Sharif later on Thursday told reporters in London that he will go back to Pakistan to attend the next court hearing, scheduled for Oct. 26. In his televised comments, he said he was removed from office by judges on a trivial charge. The charges stem from a trove of documents — known as the Panama Papers — that investigators say showed the family held unreported assets overseas. The family has denied any wrongdoing. The former prime minister is unlikely to be arrested on his return home as the court has already granted bail. Sharif’s political future has been in doubt since July, when the Supreme Court disqualified him from office over corruption charges. Rana Sanaullah, a senior leader of Sharif’s party, the Pakistan Muslim League, said there were “hidden hands” behind his dismissal and the spate of corruption allegations, without elaborating. Sharif was re-elected as party leader earlier this month after parliament approved a bill allowing officials disqualified by courts to hold party offices. The move angered opposition parties, which say Sharif is continuing to rule through a “puppet” prime minister, Shahid Khaqan Abbasi.